I was pretty certain that the mothership had spent the night in Dubois, and since I was getting a late start getting out of camp I couldn't help but wonder what my chances of running into them again were. Sure enough, no sooner had I gotten back onto the highway when I looked in my rearview mirror and saw the purple tandem climbing behind me. Mark and Emily had started riding about two hours earlier, which had been just long enough to catch me after I slept in. At 9,658 feet of elevation Togwotee Pass is the second highest point on the TransAm route, and the third highest pass for my ride if I include the Cameron Pass side trip I took. 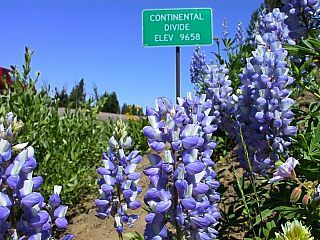 After reaching the summit the three of us agreed that it had been one of the hardest climbs since the early days of Virginia and Kentucky, and although not as high as Hoosier Pass the climbing had been much steeper. It was here at the pass that I said goodbye to Mark, Emily, and Jackie for what might be the final time. The mothership crew had to return to Dubois to meet up with another trio of friends who will be joining them soon. They had decided to complete the pass early so their friends would be spared starting their ride with a difficult climb. Immediately on the other side of the mountain the scenery of Wyoming began to change. The brown faded out of the landscape to be replaced by green, and waves of wildflowers in every color of the rainbow begin to welcome me. Red and blue, orange and pink, purple and white, it seemed that all I had to do was pick a color and wait and sooner or later flowers would appear to match my imagination. 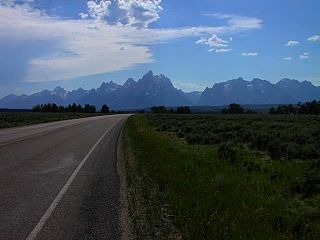 And as I rolled downhill into Jackson Hole, the Grand Tetons began to rise into my vision in the distance. The TransAm route offers an optional spur down to the town of Jackson, which I opted to make my destination for the night. I'm feeling pretty drained from the past few days of riding in the heat, so I've rented a bed for the night in a bunkhouse here. I'll decide tomorrow whether to ride or give myself another rest day before heading north towards Yellowstone. Just a quick word from one of the many people in Fort Collins following your ride. Great adventure! Great web site. Makes me feel like the couch potato that I am! Can you fit about $2,000 in fireworks on that bike? If so, pick some up for 2bld. Of course, I doubt I will get the green light this year since #2 is due at the begining of october. How was Sean's Wedding?